The leadership of Our Daily Bread Ministries has recognized the value of a volunteer program for many years, and frequently receives inquiries about service opportunities. Today, there seems to be an intensifying interest in spending discretionary time doing “meaningful” activity — that is, service with an eternal value. That mindset sparked a renewed effort in engaging friends of the ministry to share in getting Our Daily Bread and other Bible-study materials into the hands of more people. By tapping into the time, life-experience, and ability of friends of the ministry who are looking for a way to lend a hand, we believe together we can reach more people for Christ. 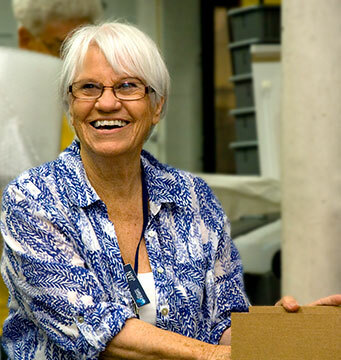 Volunteers help the work of Our Daily Bread Ministries in many ways. For example, together we participate in growing the ministry, which in turn enables us to be better stewards of the resources God has given us. The helpful spirit of our volunteers stimulates and encourages paid staff to serve with more enthusiasm. Together we multiply resources by saving time spent doing in-house projects and expenses on projects that would otherwise be outsourced. As a volunteer you will experience joy and satisfaction as you spend your time in a meaningful, fulfilling service. For some, it will represent a new lease on life. For others, a long-awaited chance to serve. For still others, a much-needed link to Christian fellowship. Some volunteers consider their gift of time as an investment in their future as they gain new work skills. We want to provide a nurturing environment that will complement your motive to join the ministry. People increasingly want to be involved in causes that positively impact their own life and the lives of others. Our orientation session with each volunteer assures an understanding of Our Daily Bread Ministries’ mission, standards, and policies. 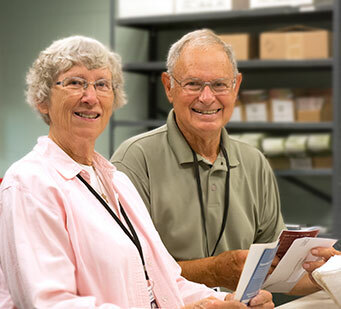 Our Daily Bread Ministries staff partner with volunteers to assure a nurturing environment, provide meaningful ministry opportunity, and increase overall satisfaction with the volunteer program. We are encouraged at how well the program has been received. Our Daily Bread Ministries moved into volunteerism conservatively. The initial invitation to volunteer consisted of a letter from President Mart De Haan to 5,000 friends of the ministry within 50 miles of the Grand Rapids office. We also invited our supporting churches to announce this new opportunity for service to their congregants and sent personal invitations to retirees of the ministry living in the area. We have seen growth in the list of active Service Partners since the inception of the program in October 2003. They serve in various departments and give anywhere from 8 to 70 hours per month to the ministry. Our Service Partners’ gift of service is about 4 times greater than the U.S. national average volunteer. When we receive a response to the invitation, the prospective volunteer is invited to visit Our Daily Bread Ministries for a personal meeting with our staff and a tour of the facility. This interaction is a critical component to the success of the program. We are careful to match volunteers’ needs with our need for assistance, so during our initial meeting we discuss their interests in areas of service. Research indicates that volunteers are satisfied with their service 95% of the time if the “right” position is found for the person—one that satisfies their reason for volunteering.